Late September, what better time to feature a review of a pair of sunglasses? No? Well maybe I should justify it then; just because it’s not summer doesn’t mean there won’t be sunny days, the sun is lower in the sky so sunglasses are more important, these have light reactive lens so can be worn on dull days too? Still not convinced? Well I’m writing the review anyway so tough! My previous pair of sunglasses broke, or maybe I broke them! Either way a need for a new pair arose. Sunglasses are a thing of personal preference in several ways, one personal preference of mine is for full frames; I just don’t like those with exposed lens at the bottom, they seem to have a tendency to steam up more readily for me. I also like to have a decent amount of ‘wrap around’ and on this occasion quite fancied something with a variable darkness to the lens. Basically my pickiness narrows down the potential choices quite a bit and then my unwillingness to spend £100 on a pair of sunglasses rules out the like of Oakley and all the designer stuff. So I’d been looking at the UVEX glasses, there are a whole range of options, full frames, half frames, variable lens, clear and tinted etc. But for some reason I just couldn’t find the combination that I wanted and at a price that satisfied. Then I stumbled upon the Endura Mullet glasses. I don’t know why I didn’t check out Endura earlier in my searching; I know they do a good clothing range but in my mind clothing and sunglasses just didn’t seem to connect. 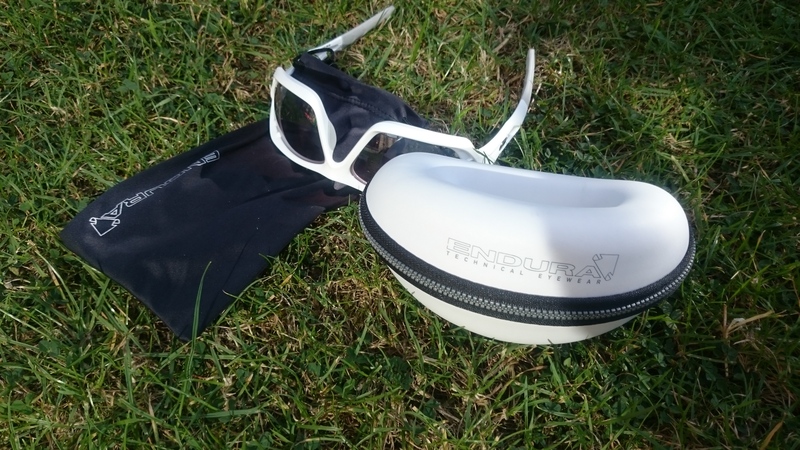 The Endura glasses seemed to fit the bill, full frames, they wrap around well, a reliable brand, not expensive and with photo-reactive lens as a bonus. They come in a hard case and with a soft sleeve too as per the photo above and you can choose from a range of colours; Orange, two Greens, two Blacks, Silver and the White that I chose. One thing you might not notice from the photos is that the lenses are vented too; useful for those long hot summer hill climbs (I’ll let you know next year!). One thing that has become apparent from wearing them is that they are quite big and having them in white accentuates this. So people have commented on them and certainly noticed that I’d bought new shades, there’s no ‘under the radar’ here that’s for sure. But they don’t feel particularly heavy to wear and although comfort is a personal thing I’m perfectly happy with them in that regard. Being white the lower part of the frame is quite visible while worn too, this again doesn’t bother me but might be seen as a distraction by some. As for the light reactivity; they don’t seem to react much at all. They just seem to be a much lighter shade of lens than I’m used to and then not darken from there. It means that riding in low light and into the Autumn evenings I can see really well but when driving my car towards the sun they cut out a lot less light than I would want. In this regard they are a little disappointing, or maybe I have higher expectations of how they should respond. I might contact Endura just to make sure that there isn’t a non-reactive version that I’ve got accidentally. Overall though, I’m pleased with the glasses, they fit my head well and I think they look the part, particularly when wearing a cycling helmet. 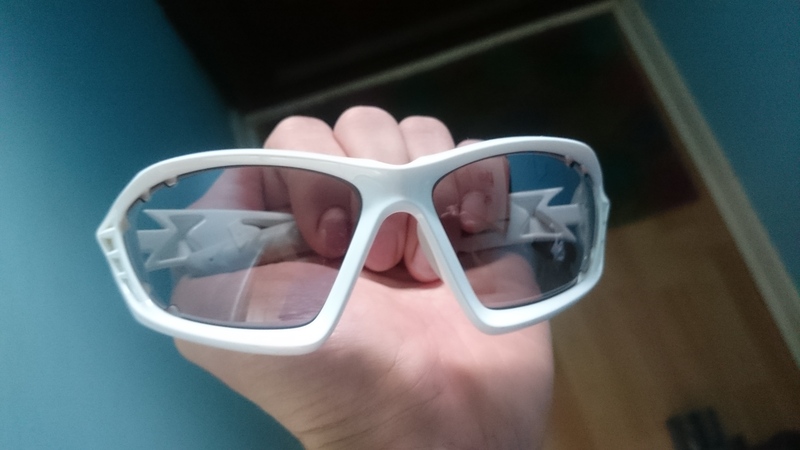 I can see through them and continue wearing them when the sun begins to go down and in heavy cloud too. I just need to wait for a really sunny day to test whether they darken enough for me.